Walking into the Royal Festival Hall last Sunday afternoon, it was as if one had stepped backstage by mistake. In a mood of pre-show frenzy, the entire audience seemed to be straightening shirts, brushing down jackets, fixing up hair, combing, smoothing, pinning, crimping, ready for the big moment when, each with their choral comrades, they filed on stage to give the performance of their lives for the title of Choir of the Year 2010. It was only partly an illusion. The auditorium had indeed become a kind of vast green room. Sitting in groups, brightly attired and surrounded by family supporters wearing their colours or waving flags, the six choirs competing dominated the swarming interior. They were chosen earlier this year from 150 ensembles involving 6,000 singers. Four were category winners, two were invited as "wild cards", good enough as runners-up to earn a place in the final, which was presented with cheerful grace by Aled Jones assisted by Josie D'Arby and the BBC Singers. Perceptions about choral singing have shifted radically since Bill Kallaway founded the biennial competition in 1984 with sponsorship from Sainsbury's. Back then, no one accepted the idea that stuffy old choirs could be fashionable, as well as socially inclusive with everything that expression implies. TV activists such as Howard Goodall and Gareth Malone, not to mention the American teen hit Glee on Channel 4, have engendered a fresh and informal, still highly disciplined, enthusiasm. Another cool advocate, Brian Eno, who sings in an a cappella group each week, makes it sound obligatory pleasure: "Singing is the key to long life, a good figure, a stable temperament, increased intelligence, new friends, super self-confidence, heightened sexual attractiveness and a better sense of humour." And he should know. Think about that as you reach for the latest snake oil. The niche days of blazer and club tie, or surplice and cassock, are over. Now anything goes. The bright-toned and glamorous schoolgirls of the Holles Singers from Hampton, Middlesex – youth category winners – could find alternative careers on the catwalk if they tire of traditional Georgian music or their fine Cabaret medley. The equally chichi yet entirely different all-female Rainbow Connection Singers from Doncaster, aged around 18 to 24, who sang music from Jeff Wayne's The War of the Worlds, could complement any musical. They already all look like Tallulah Bankhead. I particularly enjoyed the University of Central Lancashire Chamber Choir, all students, who put gutsy, riveting energy into Mozart ("Dies Irae" from his Requiem), Bob Chilcott and Broadway. How many pub nights did they skip to achieve this expert drill? The Choir of the Year 2010 title went to one of the wildcard finalists, the Wellensian Consort, ex-pupils at Wells Cathedral school where they had been beneficiaries of the UK's unrivalled collegiate choral tradition. Now all are pursuing varied careers but still reunite to follow their first love: singing. Their passion and enjoyment translated into emotional, professional-quality performances of John Rutter's "A Choral Fanfare", Rheinberger's "Abendlied" and the spiritual, "Didn't the Lord Deliver Daniel?". Yet it was the two children's choirs who really stole the show, both, remarkably, formed only two years ago. The dedication of any choral director cannot be overestimated, but especially those working with the young. The tiny New Forest Children's Choir, winner of the children's category, is run by Alison Russell-Hayward. It has 20 singers aged five to 12, from different schools and backgrounds in the Christchurch area. A talented girl soloist in Howard Goodall's tricky "The Lord is My Shepherd" hit every note, pure and bell-like. Even the smallest child opened her mouth as wide as a new bird awaiting worms. 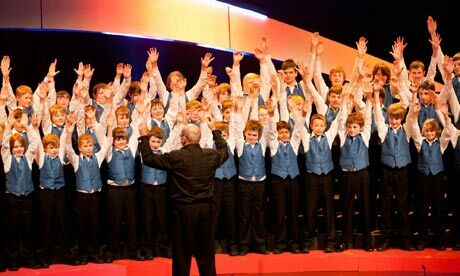 Most heartwarming of all was the "wildcard" Warwickshire County Boys' Choir, set up in 2008 as part of an open access project. Persuading eight- to 13-year-old boys to comb their hair, let alone join a choir, is a tough call. It takes a particular kind of popular genius. Choir director Garry Jones is one. Of the 60 boys, from 40 different schools, many have suffered social or educational problems, including ADD and dyslexia. Most had never sung before. A few have endured playground taunts for choosing to. A single father, currently unemployed, whom I met by chance, said he had feared the costs would be too high for his nine-year old son to join. But the uniform is simple – a blue waistcoat with school shirt and trousers – and most expenses are covered. I also met the boy. What did he enjoy best? "The breaks," he replied, all smiles. Second best? "Firefly" – referring to a hushed, delicate song by Andy Beck which they sang with unembarrassed, relaxed beauty. "Maybe that was the most charming thing in my life," commented Eric Whitacre from his judge's chair, struggling for words. Gathering himself, he managed to add: "This is our future."